[XPB-S53-315] The Aerada (TM) Futura Faucet with Accu-Zone® is constructed in a sold cast brass body and chrome plated. Centershank or 4" centerset mounting is standard with optional 8" centerset mounting with mounting plate. 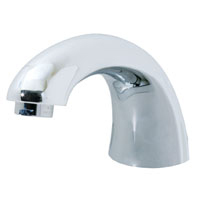 Faucet is virtually vandal resistant, all controls are sealed and located inside faucet. Faucet is equipped with reliable Infrared activation and operates at a constant 20-80 psi and powered by a 24V Class II transformer. No touch operation electronically opens a solenoid valve and controls the flow in the basin without splashing. The Aerada (TM) is ADA compliant and works at both front and side approaches. Water can be delivered at room temperature or controlled at 105`F. with a thermostatic mixing valve sold separately (See Vernatherm (TM)). Additional specifications and detailed information available upon request. For shipping quotes, orders or questions please call our Customer Service Center at 1-877-483-9270.